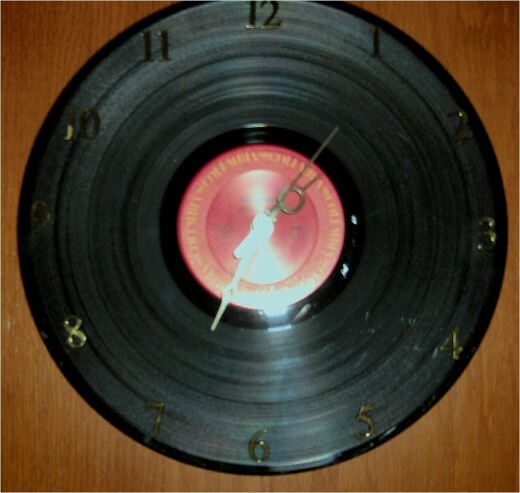 Even my clock is a record! Way back in 1969, I purchased my first truly high-fidelity system (I’m speaking components here, as opposed to self-contained “record players,” ”HiFi consoles,” etc.). I was in the Army and the base had an audio club where I purchased a Dual turntable, an Akai receiver, and Fisher speakers. Hardly “high-end,” but it sure sounded good! I have since bought, sold, and traded dozens of audio components and the system I have now consists of components from such venerable brands as Threshold, Oracle, Adcom, Dahlquist, Velodyne, Nakamichi, Yamaha, dbx, and Teac. (And I still have a Dual changer, but not the same one!). If I had to purchase my current system today all at once, I couldn’t afford it. But it sure sounds good! Today’s CDs (and CD players, especially the high-end players) sound much better than the early samples and SACD (super-audio CD) is better yet. I have to say, however, vinyl still sounds better, at least in my opinion. (I have a 24-year old stepson who feels the same way, even though our musical tastes are VERY different, so this is not just an “old-fogy” phenomenon!) But today’s “audio” equipment is not just about CD vs. records or tape any more. I get a catalog at least once a month from a purveyor of high-end audio and the first ten pages are usually chock full of “network audio players,” “digital music players,” “streaming audio receivers,” and iPod players. There are usually a few pages to digital-to-analog converters (DACs) which are necessary if the human ear is to hear anything recorded digitally. Virtually all these gizmos have USB connections to “interface” with a computer. 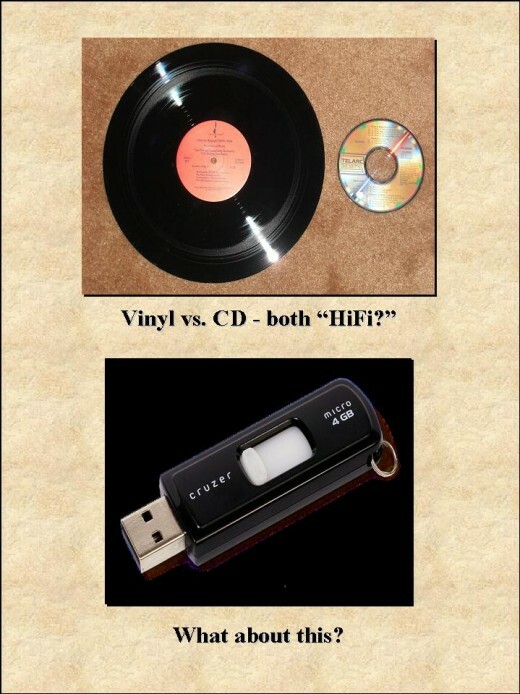 Now I know lots of people have iPods, iPads, MP3 players and the like, but what in hell does this have to do with HiFi? This is drastically compressed musical information stored on tiny little hard drives and then played through (ostensibly) HiFi equipment. Yeah, they sound ok, but “HiFi” they ain’t. If one were to take a walk into a large “big box” store, such as Target and Best Buy, one would be hard pressed to find any truly audio gear. It’s all home theatre, “boom boxes,” and micro-systems with the ubiquitous iPod dock. When is the last time you saw a good old, stereo receiver in a store? Now I know today’s music (if such it can be called) consists of three or four minute long pop tunes with a minuscule dynamic range (i.e., the difference between the softest and loudest parts) and is perfect for these new gizmos. (Ever notice the advertising for these digital players? 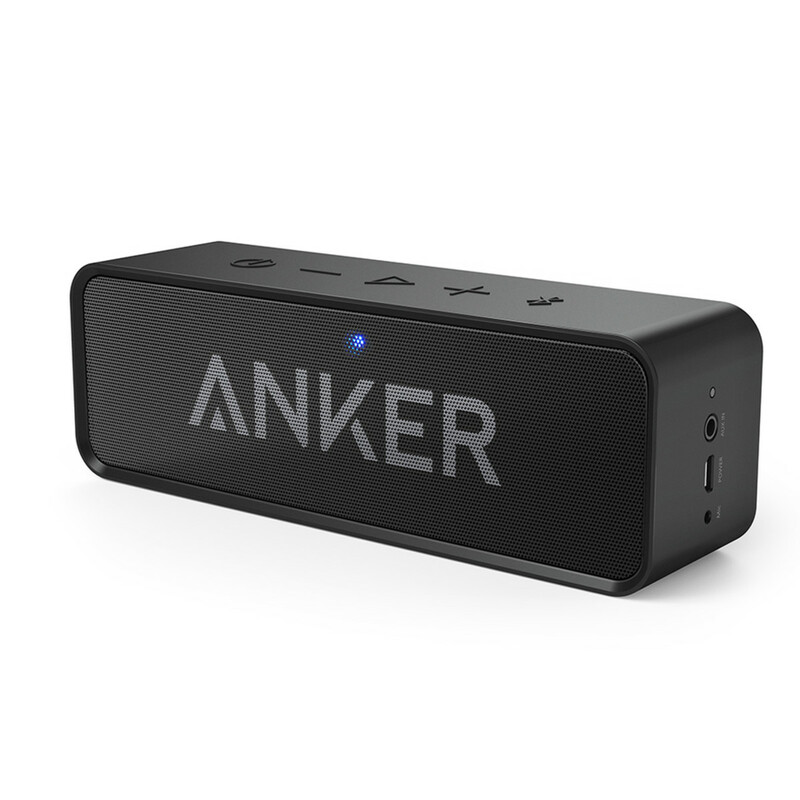 “Holds up to 1000 songs.” “Songs?” How about symphonies, concerti, operas, or even arias? Sigh.) By the way, speaking of pop music, what ever happened to rock n’ roll? I guess that’s a topic for another article. Well, I guess I’ll keep listening to my record, tape, and CD collection through my audio system and leave the iGizmos to the younger generation. Tell you what, though -- any of you reading this wondering what the “high-end” is all about, drop into an AUDIO store (i.e., an establishment dealing in true audio equipment - look around, you’ll find them here and there) and sit down and LISTEN. You’ll see (and hear) what I mean. In the meantime, whatever your pleasure, good listening! 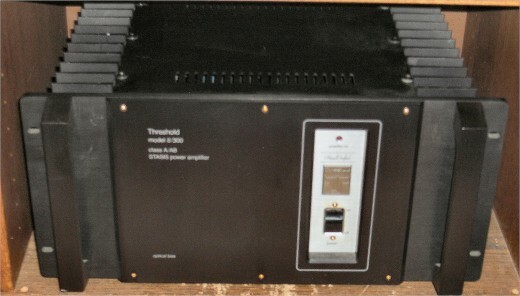 A true piece of Hi-Fi equipment: a Threshold S/300 power amplifier. About 27 years old and it still sounds great! 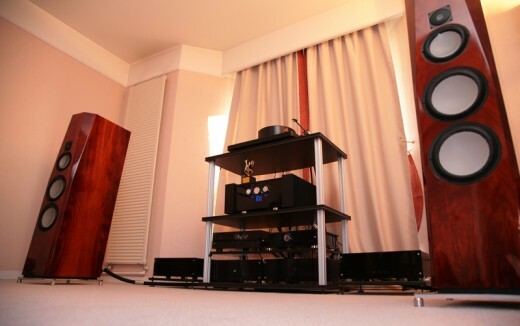 A "high-end' system in a specialist audio store - great sounding components few people can afford! The trick is to get as close to the accuracy of such a system within the constraints of your budget. I'm a young person of this "Millennial" generation who grew up playing with cassette tapes. Somewhere along the line I "discovered" the joy of vinyl and have spent hours really listening to and comparing a variety of different sources and equipment. What you mention about the inferiority of today's "iGizmos" is true for the most part. MP3 files are inferior for sure, and not all computer sound cards have a flat output. However if one plays a WAV file (lossless, not size-compressed) on a computer or other portable digital player (iPhones seem to have the flattest output amongst similar digital gizmos), and pays careful attention to the software settings, eliminating all "enhancement" features, the result is equivalent in quality to CD sound. On the other hand, the dynamic compression within a track is a matter of the way the music was mastered in the studio, not something inherent in the file format. Hi Alex, yes you nailed it on the head. 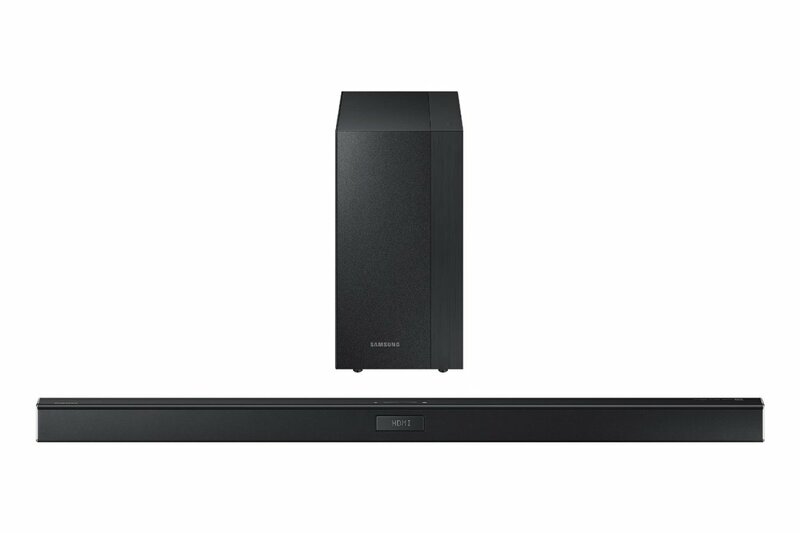 As a sophomore to this HiFi world, I have started building my system up into something I really appreciate. Albeit I am not into the vinyl yet, I am stretching the limits of what I can do with Apple Lossless. My big upgrade this past year was to purchase the Apple 160g Classic, docked on a Wadia 171i digital station, directed to an Emotiva DAC. I am pretty impressed with this set up. We always have that nagging feeling of “just one more tweak will produce this much more detail” and I am hooked. I truly appreciate this awesome hub.Thanks.